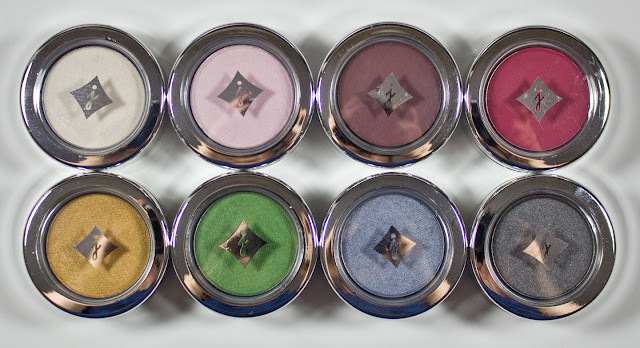 Jordana Cosmetics Color Effects Powder Eyeshadow in Snow White, Pink Of Me, Mauve My Way, Rock Star, Heart Of Gold, Splurge, Eyedolize, & Gunmetal. These retail for $1.99US and $2.00 CAN. There is no seller for this line in Canada except the 99 cent store in the GTA (and not where I got these lol). 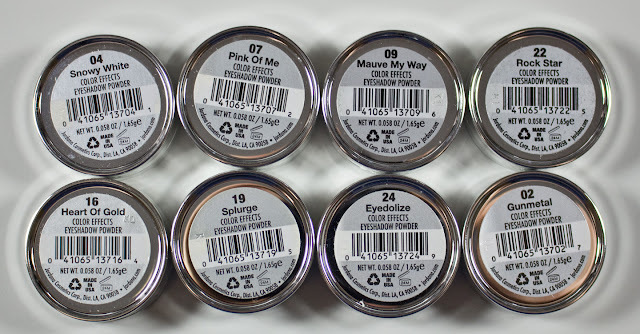 I just so happen to find these at an independent dollar store in my city and Len's Mill (Ontario) had a small section they sold and I was able to order a few more shades from the Jordana online. Talc, Ethylhexyl Palmitate, Zinc Stearate, Lauroyl Lysine, Methylparaben, Sodium Dehydroacetate, Propylparaben, Butylparaben, Ascorbyl Palmitate, Glycine Soja (Soybean) Oil, Tocopherol, Mica, Tin Oxide. +/- May Contain: Titanium Dioxide (CI 77891), Iron Oxide (CI 77491, CI 77492, CI 77499), Carmine (CI 75470), Ferric Ferrocyanide (CI 77510), Manganese Violet (CI 77742), Blue 1 Lake (CI 42090), Yellow 5 Lake (CI 19140), Ultramarines (CI 77007), Bismuth Oxychloride (CI 77163), Chromium Oxide Green (CI 77163), Chromium Hydroxide Green (CI 77289). Product: All these shade are wonderfully pigmented. Some were a tad sheer but these colours work very well over a primer to intensify those colours. 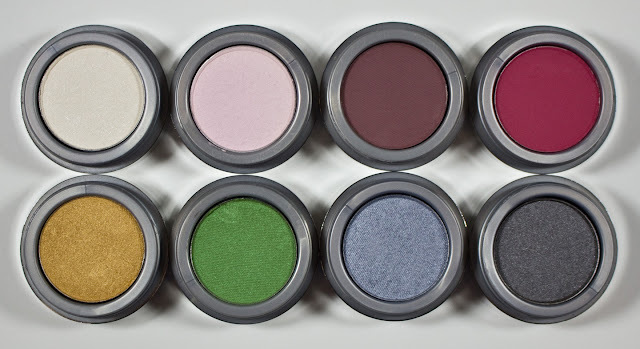 The matte shades were powdery but not chalky in nature but there two are also on the sheer side. The shimmery shades were smooth to apply to the skin along with the one satin shades I had. Snow White is a is a sure white with a shimmer finish. Pink Of Me is a sheer white base with pale pink aura pigment with a satin finish. Mauve My Way is a warm plum/burgundy with a matte finish. This one is slightly sheer and powdery. Rock Star is a pink/red with a matte finish. This one is slightly sheer and powdery. Heart Of Gold is a is a yellow gold with a shimmer finish. Splurge is a light lime green with a shimmer finish. 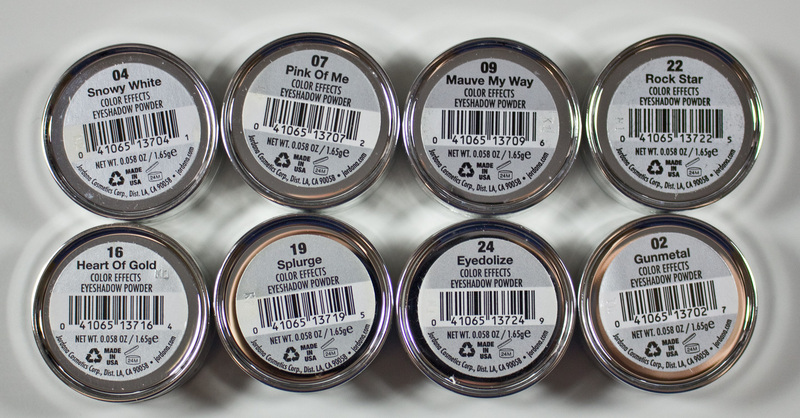 Eyedolize is a cool silver with a shimmer finish. Gunmetal is a need grey with a silver shimmer finish. Wear: Close to 8 hours wear on their own. Packaging: Simple pan eyeshadow housed in a tray with an outer jar to contain that. 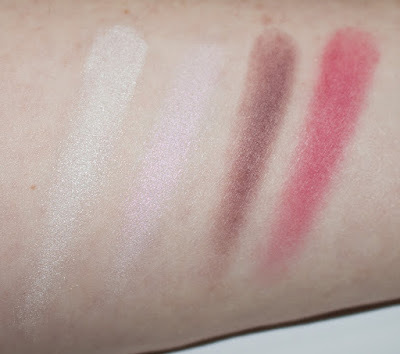 Daylight swatches: Snow White, Pink Of Me, Mauve My Way, & Rock Star. 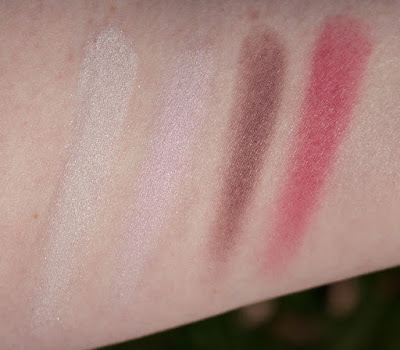 Flash swatches: Snow White, Pink Of Me, Mauve My Way, & Rock Star. 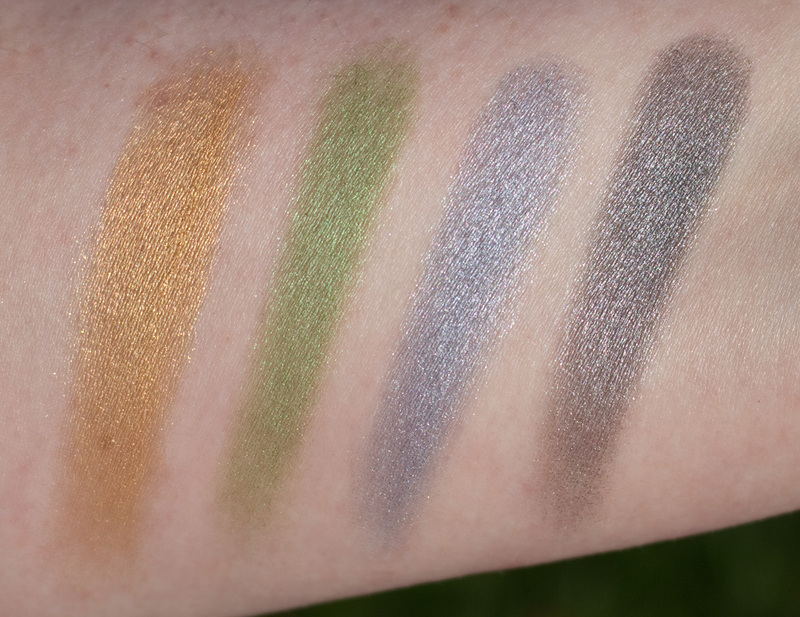 Daylight swatches: Heart Of Gold, Splurge, Eyedolize, & Gunmetal. 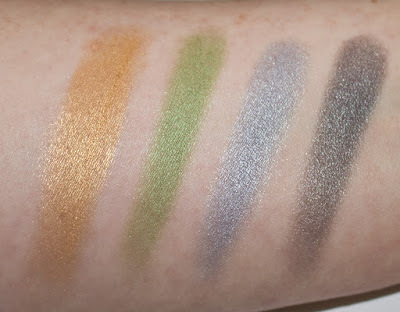 Flash swatches: Heart Of Gold, Splurge, Eyedolize, & Gunmetal.